New solar shading panels made from lightweight, durable Lexan™ Exell D polycarbonate (PC) sheet from SABIC’s Innovative Plastics strategic business unit, are making a major contribution to energy efficiency and comfort at the new flagship City of Westminster College in central London. The high-performance panels filter out direct sunlight to minimize solar gain and glare on computer screens. They also admit generous amounts of natural light and are expected to significantly reduce building energy requirements, and maintenance and lifespan costs. SABIC’s ongoing investment in environmentally responsible materials for the global building and construction industry is helping customers meet their sustainability goals with new eco-progressive products. 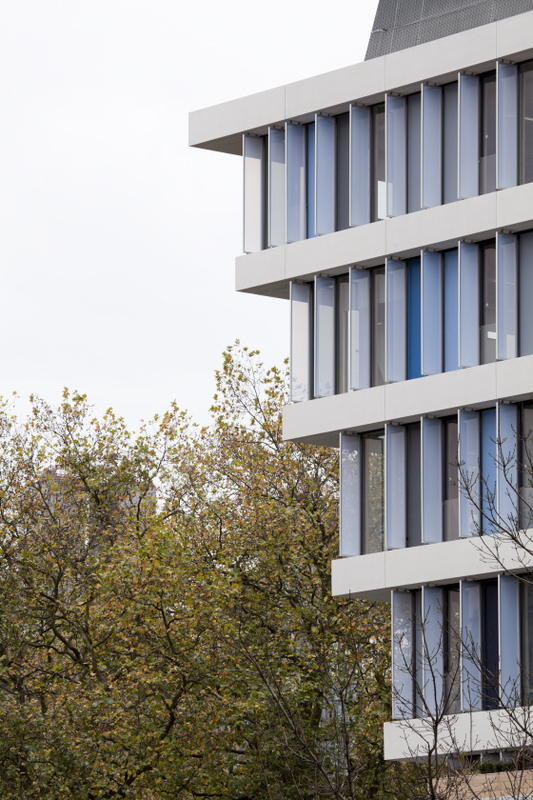 The distinctive, cantilevered building for City of Westminster College – a leading continuing education college offering over 200 vocational and academic courses to students – was designed by schmidt hammer lassen architects to minimize energy usage and carbon footprint. This sustainability strategy includes full-story, vertical solar shading panels fabricated by Colt using custom-colored, translucent Lexan Exell D sheet, which flank the windows on the east and west façades. The solar shading panels, also referred to as a “brise soleil” system, are fabricated by framing 3.5 m by 5.76 m rectangles of solid Lexan Exell D sheet. They are mounted on either side of the building’s windows on the façades that receive major exposure to sun. SABIC provided color-matching services and technical support to Colt, and backs the material with a 10-year limited warranty against breakage, yellowing and loss of light transmission. Weighing only half as much as glass, Lexan Exell D sheet reduces the amount of material required for structural supports. The PC sheet also provides high impact strength (250 times that of glass) and flame retardance (compliant with the European fire standard EN 13501-1) for safety, and complies with glazing security impact resistance according to Pr EN 356. Other key properties are dimensional stability; ease of handling and installation; and resistance to yellowing, graffiti and breakage. SABIC’s robust Lexan PC sheet products are lightweight, flame-retardant materials, available in monolithic and multiwall configurations, which are used worldwide for roofing, cladding and glazing massive stadiums, hotels and other impressive structures. They are designed to allow penetration of natural, filtered daylight into living areas without heat build-up. Lexan sheet products can address performance challenges such as color fading, marring and scratching, cracking, rusting, and paint peeling that occur with metal, wood, stone, glass, and other materials. They can be designed with capabilities such as double-sided ultraviolet protection and special coatings that provide a self-cleaning feature or protection against graffiti. Lexan sheet can be cold formed and bent into complex shapes using conventional equipment, and can be enhanced with colors, textures and special effects. Further, the lighter weight of plastics compared to glass allows these materials to be used in large structural components. Lexan sheet offers extremely high impact resistance to minimize the risk of breakage – even when subjected to violent blows by heavy objects. For additional information on SABIC’s Lexan sheet solutions, please go to www.sabic-ip.com. For technical product inquiries, please contact us at www.sabic-ip.com/prtechinquiry. Saudi Basic Industries Corporation(SABIC) ranks among the world’s top petrochemical companies, and is a global market leader in the production of polyethylene, polypropylene, advanced thermoplastics, glycols, methanol and fertilizers. SABIC manufactures with a global footprint in Saudi Arabia, the Americas, Europe and Asia Pacific. The company operates in more than 40 countries across the world with 33,000 employees worldwide. It has significant research resources with 18 dedicated Technology & Innovation facilities in Saudi Arabia, the USA, the Netherlands, Spain, India and China. SABIC recorded a net income of SR 21.59 billion (US$ 5.73 billion) in 2010, and sales revenues totaled SR 152 billion (US$ 40.5 billion). SABIC’s Innovative Plastics strategic business unit is a leading, global supplier of engineering thermoplastics with an 80-year history of breakthrough solutions that solve its customers’ most pressing challenges. Today, Innovative Plastics is a multi-billion-dollar company with operations in more than 35 countries and approximately 9,000 employees worldwide. The company continues to lead the plastics industry with customer collaboration and continued investments in new polymer technologies, global application development, process technologies, and environmentally responsible solutions that serve diverse markets such as automotive, electronics, building & construction, transportation, and healthcare. The company’s extensive product portfolio includes thermoplastic resins, coatings, specialty compounds, film, and sheet. Innovative Plastics (www.sabic-ip.com) is a wholly owned subsidiary of Saudi Basic Industries Corporation (SABIC).